Foodbuzz 24, 24, 24 – A culinary "laap" of Laos | eat. live. travel. write. Our Foodbuzz 24, 24, 24 event was inspired by our recent trip to Laos. We had the idea of sharing our culinary adventures at Tamarind Restaurant‘s cooking school with some friends by recreating the experience in our tiny Toronto kitchen and/ or backyard, weather cooperating. To my point, most of the ingredients we used came from our regular grocery delivery company. As they unloaded what seemed like hundreds of boxes containing coriander on Friday morning, I am sure they wondered what on earth we were up to. Saturday morning dawned bright and sunny teeming with rain, so Neil’s tennis was cancelled and he got to help with the mise en place for the five (!! what were we thinking?) dishes our guests would prepare. And I got to work prepping the fruit shakes. What would a day in Laos be without a fruit shake (or many…)? Finally after a few fruit shakes and some wonderful South East Asian beers (Tiger Beer, Singha, Saigon and Tsing Tao – our “students”‘ contribution to the evening – yum and thanks! ), we got down to business. First up, Jeow Mak Keua and Jeow Mak Len (spicy aubergine and tomato dips as featured on this post). Our sticky rice was kinda gluey 🙁 Definitely something to try again though, altering the ratio of water to rice (I think we used too much…). In any case, it didn’t stop people from eating it! 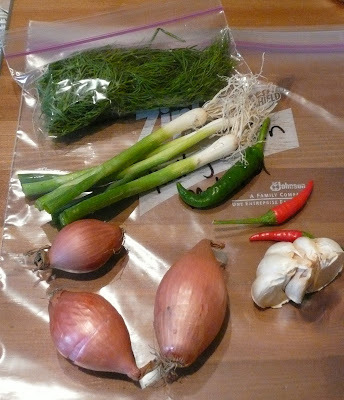 After a brief tasting session and some more palate-cooling beers, we set to work on the next dish, stuffed lemongrass (as featured on this post). At this point in the evening, one of our students had to leave briefly to go and collect her daughter and things in the kitchen kind of lapsed. A couple of us stayed in the kitchen to prep the Orlam (Luang Prabang stew) whilst others enjoyed some Michael Jackson and more dips and rice in the living room (it was his birthday after all…). You know, as you do! The Orlam was originally featured in this post. Finally around 11.30pm we were finished! Verdict? Well I asked people for some thoughts (disqualifying Yvonne’s “yummy” as it was not descriptive enough) and the general consensus was that wow, yes, you CAN make exotic foods with everyday ingredients. People seemed impressed with how easy some of the more visually impressive dishes (the steamed fish and the stuffed lemongrass) were to make and I am certain these might be appearing on some dinner party menus fairly shortly. As for me? Well I am totally exhausted but it was such a fun night. My only wish? That our kitchen was larger or that we had a bigger stove and/ or barbecue to expedite some of the dishes but on the whole, in our tiny space, I think we managed pretty well. The dishes tasted fairly authentic (although Neil and I realised that we actually forgot a few ingredients in a couple of dishes in the melée) as in, they tasted like what we had in Laos. Our next Lao culinary challenge will be a dinner party later in the fall where we will attempt to recreate some of these dishes again (only better!) as well as the Lao favourite – laap. Stay tuned! Thank you Foodbuzz and sponsor VISA Signature for the opportunity to share a little part of our Lao experience with our friends. I’ve already got my thinking cap on for a future 24, 24, 24 event!!! 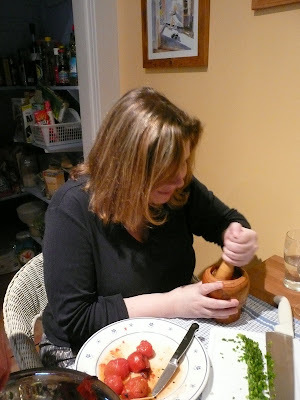 My biggest discovery of the night was probably the pestle and mortar. I've always stayed away from any recipe that called for it as it just looked too complicated. Not so! After this Laos dinner, I'd have to reconsider. The ingredients and dishes were all so aromatic, and bashing the herbs and spices about made all the difference. Great easy recipes – absolutely fantastic and thank you! An amazingly delicious, whimsical and fun evening – thanks Mardi and Neil! I had such a great time, and yes, I do feel more confident now that I could pull off some fancy dishes with my minimal culinary skills. Looks like such a fun night! Great idea! I empathize with the small kitchen situation – ours is under 36 sq ft in NYC and it was tight last night preparing for our Foodbuzz 24, 24, 24! Padaek is an essential ingredient of Laos cooking. How did you manage to make padaek beforehand and for how long did you ferment it? Also the type of rice used in making Khao Niau is quite a different variet to that usually obtained in westen supermarkets. Did you manage to get the real variety? Orlam has buffalo skin in it as well. Where on earth did you get the buffalo skin? Oh I love it, this is a great post! Well done!!! Alicia – of COURSE you can make those dishes!! Thanks for coming! High/Low – thanks and bravo for getting your dinner done in your tiny kitchen! I am impressed! Anonymous: We found proper sticky rice at T&T Supermarkets here in Toronto. We did not use buffalo skin. Instead of padaek, we used regular fish sauce, also obtained from T&T. So probably not as authentic as you might get in Laos, but close! "Aren't you that cook guy? I cooked your barramundi in Macamia nuts the other day". Kerr was chuffed and replied, "How did you enjoy it?" "Well we didn't have any barramundi, so we used some sardines; and we didn't have any macadamia nuts, so we used some salted peanuts. We also didn't have any Chablis, so we used some cooking sherry. It tatsed horrible. Are you sure you know what you are talking about?" Love the Galliping Gourmet story — but hardly think it applies to this outing. Sounds like you managed to get almost every single authentic ingredient, created fine Laos dishes, and had a fun time doing it: I'd rank that as a success, and say that it's in the right spirit. Stuffing lemongrass. I like that very much. It is all so inspiring. I will take up the next 24,24,24 challenge. Looks so much fun! Hope the instruction did not start to waver too much as the evening wore on…and Singha sank in. Too bad we could not locate any Beer Lao! See you all on the 12th September for our next cooking challenge/installment, featuring George the (noew) Cured Piglet. Oh my Gosh, I want to move to Toronto in hopes of being invited to one of your dinner parties! this looked like so much fun for people to get to experiment with recipes and ingredients they don't normally encounter. Your love of foods and cultures comes through and makes me smile! As for the Galloping Gourmet Comment — Those who do, do, those who can't criticize! Thanks Dawn – and if you ever are in Toronto you are most welcome to come and cook here! Highly amusing comment Dawn. When you are in Laos perhaps you might like to visit the restaurant I run in Vientiane, which serves both Lao and western food. Anonymous – perhaps you can give us the link or name of your place? Wow, this all looks terrific and you did such a good job describing the evening. I only wish I could have made your kitchen a little more crowded by being there. And I used to love watching Julia Child AND The Galloping Gourmet drink wine and cook. They were both so happy and carefree. I felt kind of "foodie" tonight because I made batches of pesto with all the basil I was surprised to find still growing nicely after 10 days away. Kablooey – we would have loved your company! Glad you're home safe and sound! Actually, just wow factor, Denise!! So easy you will wonder why you didn't think of it! What a brilliant idea, looks SO delicious and like a lot of fun! Thanks, it was like a little trip back to Laos for the evening for our tastebuds! Sounds like a great time and a delicious meal! What a fun party and everything sounds delicious! Sounds like you recreated the magic of your trip! By the way, I was not being nasty. I am sure what you cooked was delicious but I just wanted to ppoint out that it is very hard to cook authentic Laos food. For example coconut milk is very rarely used in Lao cooking, but often in Thai. Please visit next time you come to my country. 5 star foodie: yes it was a very fun night, thanks! Anonymous, of course it is hard to cook authentic Lao food when 1. you are not Lao and 2. you live in Toronto! Part of the fun!!! Congrats! Sounds like an exhausting but exciting time. Tasty Eats – there was not a dull moment! This looks amazing! What an awesome night that must have been !!! I agree that sticky rice made in the rice cooker just does not work. Next time, try my method. 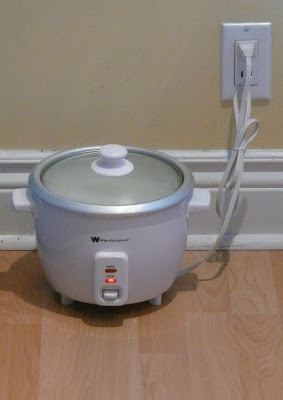 It's soooooo easy and hardly any cooking time at all http://eatblogsleep.com/?p=522 … Can't wait to see your laab post! EatBlogSleep – your sticky rice recipe is now printed and read to go for next time… Thanks! This is fantastic! I've never had Laotian food before and don't even know if I could find anyplace here in MN that serves it. But I'd love to try it, especially that lovely stuffed lemongrass! Thanks so much for a wonderful 24, 24, 24 presentation highlighting a little-known (at least to me) cuisine! Leave a Reply to Tasty Eats At Home Click here to cancel reply.